Auntie M previously reviewed this book, but now that it’s being published here in the US, the series deserves a second look in case you missed it the first time around. Welcome to the world of Hettie Bagshot and her best friend, Tilly, in The No. 2 Feline Detective Agency. And what a world it is! Not one for inserting a cat as a companion to a human, Morton has these cats inhabit their own world, complete with sly references and ripe with innuendo. In the true spirit of the books, sales will help feed, shelter and find loving homes for less fortunate cats. Hettie Bagshot and Tilly live in the Butter Sisters Bakery back room, a perfect spot for warming ovens, and replete with staff luncheon vouchers to hold hunger at bay as the dynamic duo await their very first case. (The idea for becoming a private detective occurred to Hettie when she was watching the long-running play A Mouse Trapped.) When that case turns out to be a search for missing dead cats, the reader knows the hijinks can’t be far behind. Marcia Woolcoat, the matron of the Furcross Home for slightly older cats, promises a Dignicat burial when each cat’s time has come. Unfortunately for her, three recently deceased cats have been dug up and their corpses stolen, reminding Hettie of the infamous grave robbers Bert and Hair. The fun keeps piling on as Hettie knows the Furcross cook from her touring days with her band, echoing Morton’s earlier professional days as a songwriter-musician. Marley Toke specializes in Jamaican food for the cats and grows her own catnip in the garden. With financial transactions providing rent and food for Hettie and Tilly, the fact that they have no idea what they’re doing seems besides the point. Readers will meet Hettie’s plumber friend Poppy Phene, who drives the cats around in his van, while they chorus to Tabby Wynette’s version of “Stand By Your Van.” It’s not like Hettie is the FBI–the Feline Bureau of Investigation–so she has to use her wits to keep her retainer with Marcia going. The guests at Furcross range from the gardner, Digger Patch, to the dashing Marilyn Repel, late of The Prince and the Showcat, with star Larry O’Liver. Marilyn’s daughter, Cocoa is a fashion designer, working in concert with nail specialist Oralia Claw. And there’s the nurse, Alma Mogadon, who is keeping dark secrets of her own. If Hettie has the brains, Tilly keeps the duo going on a daily basis with her housekeeping and secretarial chores. And don’t forget Tilly’s favorite author, mystery writer Polly Hodge, an homage to the cat of P D James, friend and mentor to Morton. Tilly’s reading Hodge’s newest: An Unsuitable Job for a Cat, along with others by Nicola Uptide and Alexander McPaw Spit. Any mystery lover will find themselves smiling at Morton’s sly humor. Auntie M quite enjoyed the twisted plot–yes, there IS a plot–and a mystery to be solved in Hettie’s inimitable fashion, assisted by Tilly. There is genuine love between the two cats, and anyone who isn’t enamored with the series needs to run right out and adopt a cat–or two. Their world without humans is quite entrancing, from the details of the food eaten, to the clothes worn. 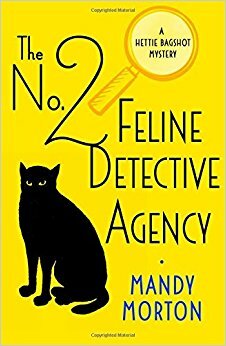 Morton has a real winner for cat lovers everywhere and a cozy series for mystery lovers. More volumes soon to be published, too. Enter the world of Hettie Bagshot and her best mate, Tilly, and be prepared to be besotted.